That's What She Fed: What to do with leftover pulled pork? 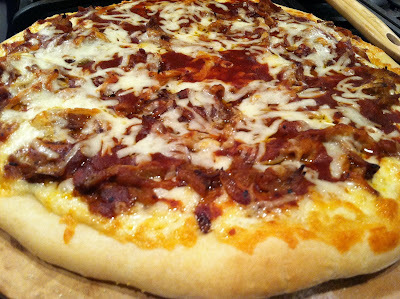 Make a pulled pork pizza. What to do with leftover pulled pork? Make a pulled pork pizza. We love pulled pork sandwiches, but after 2 or 3 of them it is time to make something else with that leftover tender meat. TWSF experimented with a pulled pork pizza, and the results exceeded our hungry expectations. The pizza only requires a few additional ingredients and can be assembled and cooked in under 20 minutes. 1. Caramelized onions - Slice onions. Heat olive oil in a saute pan over medium heat. Saute the onions for approximately 30 minutes, stirring every few minutes and adding a pinch of salt and sugar 10 minutes into cooking. If your burner is too hot, turn it to medium-low so the onions do not burn. 3. Roll out pizza dough, using flour on the surface and roller to prevent dough from sticking. 4. Toss pulled pork in BBQ sauce. Sprinkle pulled pork, cheese, and carmalized onions over dough. Lightly drizzle BBQ sauce over pizza. 5. Bake pizza in oven for 15 minutes, or until the crust is a light golden brown.